Turkish sage is an attractive, long-flowering perennial. Within the horticultural trade it is sometimes known by the (misapplied) name Phlomis viscosa, because of its sticky leaves. 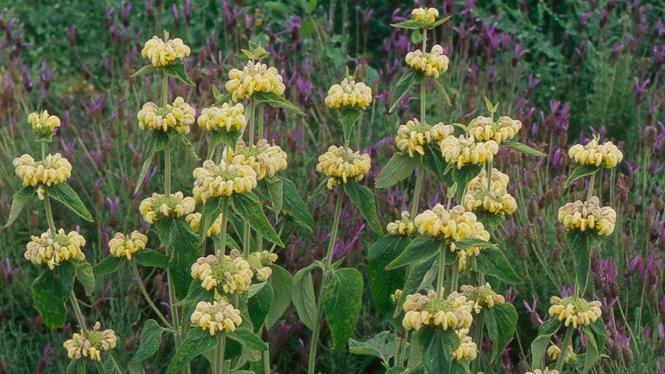 The well-known gardener William Robinson (1838-1935) described the genus Phlomis as: 'A group of old-fashioned shrubs and perennial plants', and P. viscosa itself as: 'A rather clammy plant...with...numerous bright yellow flowers of fine effect'. 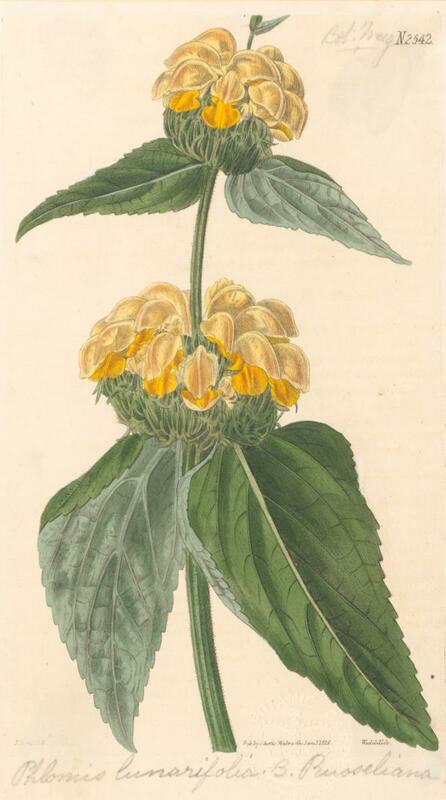 Dr John Sims, who succeeded William Curtis as editor of Curtis's Botanical Magazine from 1799 to 1827, formally named this plant (as Phlomis lunariifolia var. russeliana, in 1825), but he confused it with a similar species (P. pungens Willd.) collected in Syria and illustrated by G.D. Ehret in Alexander Russell's The Natural History of Aleppo (1786). Turkish sage is a stately plant, bearing whorls of hooded pale yellow flowers in summer and autumn. Restricted to Turkey, where it occurs mainly in the north, from Istanbul, east along the Black Sea coast to Rize, and south to Kutahya. It has been found at up to 1,700 m above sea level. Turkish sage is a herbaceous perennial, growing to about 90 cm tall, spreading above and below ground, with softly wrinkled, ovate leaves, grey-green on the upper side, whitish and densely hairy beneath. The hooded, yellow flowers appear from May to September, and are carried in whorls at intervals up the stout flowering stem. The flowers are about 3 cm long and are bee-pollinated. The fruit is a nutlet. Turkish sage is cultivated as an ornamental, and holds the Royal Horticultural Society's Award of Garden Merit. It is a good ground cover species, suppressing weeds. Recent laboratory research has been carried out to investigate the antibacterial activity of its essential oils, which show potential for use in the food industry. 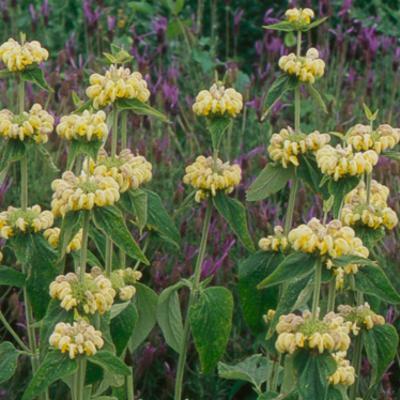 Turkish sage is a hardy species of Phlomis , which can be grown in any good, well-drained soil, in sun or partial shade. It has a long flowering-period, stretching from late spring to early autumn. It does well in sunny borders in British gardens, and is drought tolerant when established. Propagation can be carried out by division of the clumps. Phlomis russeliana can be seen growing near Victoria Gate and in the Rock Garden at Kew. Pressed and dried specimens of other species of Phlomis are held in Kew's Herbarium, where they are available to researchers from around the world, by appointment. Coniferous and deciduous woodland, clearings and in hazel scrub. Demirci, F. et al. (2008). Antibacterial activity of two Phlomis essential oils against food pathogens. Food Control 19: 1159-1164. Phillips, R. & Rix, M. (1991). Perennials, Volume 2. Pan Books Ltd.
Huber-Morath, A. (1982). 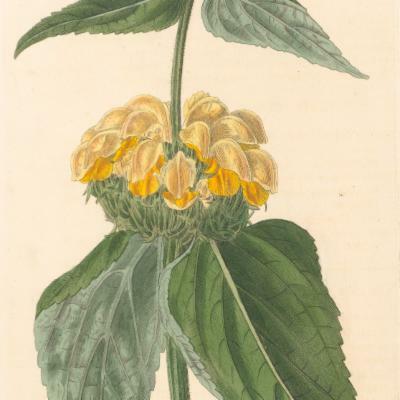 Labiatae: Phlomis russeliana. In: Flora of Turkey, Volume 7, ed. P.H. Davis. Edinburgh University Press. Robinson, W. (1933). The English Flower Garden, 15th edition. London.